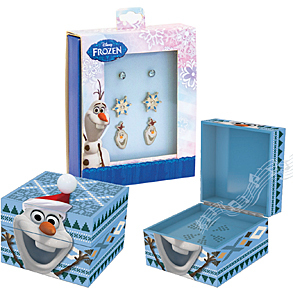 Frozen Olaf is commemorated with this adorable musical keepsake box that includes three sets of stud earrings. By Mr.Christmas, Olaf's music box from the Disney movie Frozen stands 4" high and is sure to delight. Lift the lid to hear the original sound recording of "Do you want to build a snowman."